Are you enough with converting video in advance for playing it back on iPhone iPad? And do you want to throw away the bound of iTunes to sync videos from computer to iPhone iPad? Definitely, many iOS users desire to do so especially being away from home and can't access to iTunes to make a video sync to iPhone. Good news is Air Playit can help you take control of your presentation by remote streaming video to iPhone iPad in any places and cases. Also, its handy remote control feature allows you to make offline conversion from a distance, in which way you can download iTunes incompatible video to your lovely iPhone, iPad, iPod touch. How to Remote Stream Video to iPhone iPad? Watch a video stored on your computer of any format with Air Playit on your iPhone iPad, you should first install the Server on your PC/Mac and the App Client. With Air Playit server, you can add your computer stored videos of any format to the Shared Folder. Make sure the server is running. 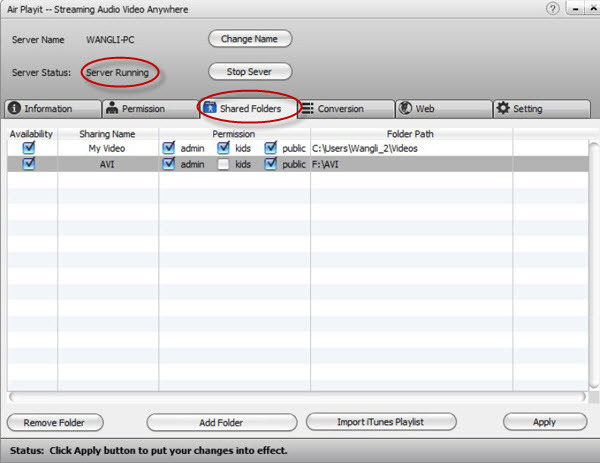 Then the videos in the Shared Folder can be instantly recognized by the Air Playit app client on your iPhone iPad. 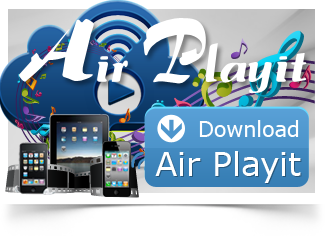 Air Playit app client will interact with the server and streaming video to iPhone iPad over WiFi, 3G or 4G network. Simply click "Play" and you can watch the video regardless its format. With Air Playit app client you can watch videos of almost any format by remote streaming video to iPhone iPad via WiFi, 3G/4G network. If you don't want to waste your network bandwidth, you can air download the video to your iPhone iPad. Just remote convert video to iPhone iPad with the built-in offline task manager and then download the video to your iPhone. 1. Click the Offline Conversion, add the FLV video to the conversion task. 2. After the offline conversion finished, go to the Air Target. Tab the refresh button, then you will get the converted videos. 3. Go to the converted video files, the download button is available now for you. WinX DVD Ripper Platinum can rip DVD to digital formats like MP4, H.264, AVI, WMV, MOV., backup DVD to a single MPEG2 file with no video/audio qulity sacrifice on Windows (10) PC/Mac. 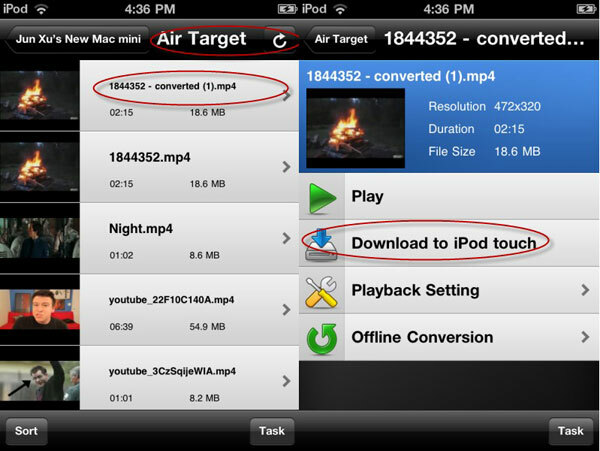 So that you can stream DVD movie to iPhone/iPad/TV with Air Playit perfectly. Imaging when you are not at home or just get ready of taking off in the airport, of course the large home video library on your hard drive isn't the ideal place to watch all of the video- you want to be able to remotely access it and watch the videos on other place. Are you tired of converting the videos before you can sync them to iPhone iPad? Now a free application Air Playit provides exactly what you need- streaming video to iPhone iPad with WiFi 3G 4G network. It brings a new introduction of how to use free iPhone App to remote access home video library. As a 100% free App, Air Playit is able to stream video library to iPhone via wifi, 3G or 4G wireless network to fulfill the remote access task.